AutoCAD provides several types of dimensions and commands with which to draw them. These commands are found on the Dimensions panel of the Annotate tab on the Ribbon. If you can’t find the button you want, it’s probably hidden in the drop-down list, under the larger button on the left side of this panel. This panel remembers the last button you used, so at any given time, it may be displaying any one of the following buttons. You can also find these basic dimension commands in the upper-right corner of the Annotation panel of the Home tab on the Ribbon. Remember that the last one you used stays on top, so the one you want now may be under the one that is displayed. Linear — DimLInear (DLI): Indicates the linear extent of an object or the linear distance between two points. Most linear dimensions are either horizontal or vertical, but you can draw dimensions that are rotated to other angles, too. Aligned — DimALigned (DAL): Similar to linear dimensions, but the dimension line tilts to the same angle as a line drawn through the origin points of its extension lines. If you press Enter instead of picking the first point, AutoCAD prompts you to select an object. And when you do, it automatically selects each end of the object for you. Angle — DimANgle (DAN): Indicates the angular measurement between two lines, the two endpoints of an arc, or two points on a circle. The dimension line appears as an arc that indicates the sweep of the measured angle. Radial — DimDIameter (DDI), DimRAdius (DRA): A diameter dimension calls out the diameter of a circle or an arc, and a radius dimension shows the radius of a circle or an arc. You can position the dimension text inside or outside the curve. If you position the text outside the curve, AutoCAD draws (by default) a little cross at the center of the circle or arc. AutoCAD automatically adds the diameter and radius symbols to the appropriate dimension type. Because radius and diameter dimensions seem to do the same thing, you might wonder when you should use which one. In most drafting disciplines, the convention is to use diameter dimensions for whole circles (for example, a hole) and use radius dimensions for part circles or arcs (for example, a fillet). You can also use DimLInear to dimension a circle or an arc. Trying to pick the endpoints of a circle can keep you busy for several hours, but if you press Enter at the first prompt and then select a circle or an arc, it applies a linear dimension across the diameter. You can also use a QUAd object snap to pick two diametrically opposite points on the circle. Arc Length — DimARc (DAR): Measures the length along an arc, and then applies a curved dimension line that’s concentric with the arc. Jog — DimJOgged (DJO): When dimensioning arcs, it is standard drafting practice to create a dimension line that starts at the center of the arc and proceeds outward to the arc itself. A problem arises, however, when dimensioning an arc with a very large radius. The center may be at an inconvenient location where the dimension line would interfere with other geometry or, worse, it may be well beyond the edge of the final drawing. DimJOgged neatly solves this problem for you. It works almost exactly like DimARc except that it asks you to specify two extra points. After you select the arc (or circle, strangely enough), it then asks you to specify a center override point and then a location for the jog itself. The resulting dimension line consists of three segments, starting at the center override point: The first and last point to the real center; the middle segment connects the first and last points by putting a jog in the line. Ordinate — DimORdinate (DOR): Applies X or Y coordinate values from the origin point. Certain types of mechanical parts can have a great many holes and other features. The drawing would become impossibly cluttered if you were to apply two traditional dimensions to show the X and Y locations of each detail. Common practice in this situation is to use ordinate dimensioning. Each ordinate dimension appears simply as a single extension line and a number showing the X or Y distance from the origin (0,0) of the drawing or from the origin of the current user coordinate system (UCS), if there is one. Normal practice is to specify the lower-left corner of the part as the origin. The X and Y values are usually aligned neatly in a row and column along the edge of the part. There are no dimension lines or arrowheads. 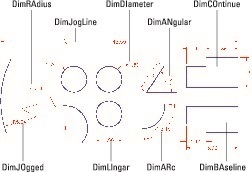 Center lines — DIMCENTER: Creates center lines or center marks on circles and arcs without applying a dimension. The definition of lines versus marks matches the current dimension style.